Looking for a holiday gift for your fav #Two-Spirit relative or bestie? 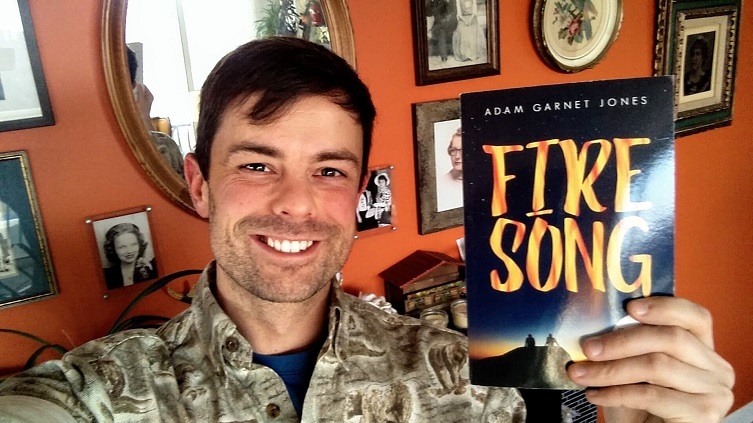 You’re in luck, just pick up a copy of Adam Garnet Jones’s (Cree and Métis) recently published novel Fire Song. As a follow-up to the highly successful movie “Fire Song,” this 2015 film can now be (re)visited in novel form – and should be on the top of your gift-gift shopping list! The story of Fire Song will be very familiar to many Two-­Spirit and Indigenous people – there are many parts of this story that is of our collective, lived, and shared experience(s). This is the power of Fire Song, both the movie and book, our community simply gets to see ourselves reflected in this story and for those who are not Two­-Spirit, we welcome you to our world. While it is important to note that the reader doesn’t get to see and experience our whole community, as there is no inclusion of our Two-Spirit sisters in this story. In Fire Song the book, Adam Garnet Jones weaves a beautiful and tender coming of age story set on a northern Ontario reserve. “Beautiful” needs to be qualified here. Fire Song gives the reader a glimpse into reservation life with all the harsh realities of sexual violence, alcohol and drugs, poverty of material and spirit, death and loss and more importantly what it mean to be alive, and the struggle of navigating and reconciling our rich traditional ways as we walk in today’s world – it is in this setting that we get to know Shane as he comes to the understanding of who he is both as a young man, who loves another man, and a proud Anishinaabe. Do not be misled that this is simply a coming of age story, Adam Garnet Jones takes up the conversation of colonization and decolonization from multiple vantages – the above qualification of “beautiful” is the peak under the veil allowing the reader to catch a glimpse of the many residual scars and gaping wounds of colonization that Native people existed, exist in and with. Shane, the main character, grapples with the deep desire to run off to the big city with his partner, David, so that they can be ‘gay’ together, as potential solution to his problems. However, in the end there is no need to go anywhere, Shane and David find out who they are as proud Anishinaabe, who happen to be Two-Spirit and that they are in love with one another. This centering and rooting of their Indigeneity is a powerful testament and a model of the deep decolonizing work that is required – where we do not have to look to the non-Native ways and people for salvation (like the gay/lesbian/bisexual/trans/queer communities and movement(s)) – all we must do is look inward to find not only ourselves but remember who we are as Native/Indigenous people. The teachings Adam Garnet Jones so masterfully demonstrates is that colonization may have taken our ceremonies away, but if we remember who we are along with a good heart, we can (re)write and (re)claim all those lost ceremonies and ways of our, Two-Spirit and Indigenous, people. In other words, walk our healing walk/journey. Fire Song is a gift and can be given as a gift on many levels.